Harriman Wastewater Treatment Plant - Harriman, N.Y. 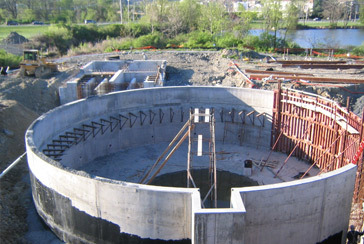 The scope of work included site demolition, excavation and dewatering for new structures and piping systems. The team constructed a new 2-million-gallon-per-day activated sludge treatment train, which included two primary settling tanks and a primary sludge pump station, two new aeration tanks each consisting of three anoxic zones and one tapered aeration zone, two new secondary clarifiers and a secondary sludge pumping station, two new chlorine contact tanks and one gravity sludge thickener.